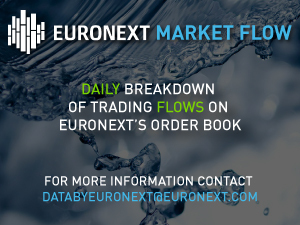 Euronext Cash Real-Time Data provides real-time full market-by-order depth, best limit quotes, and trades for all securities traded on the regulated markets platform for Euronext Cash markets; Paris, Amsterdam, Brussels and Lisbon. The Euronext Cash Real-Time Data includes the following security types: Equities, ETF/ETP, Bonds, Warrants and Certificates. The Euronext Cash Level 2 product provides real time tick by tick level 2 (full market depth) data for Euronext Cash Markets. The Euronext Cash Level 2 product also includes the Euronext Cash Level 1 data. The Euronext Cash Level 1 product provides real time tick by tick level 1 (best bid/offer) data for the Euronext Cash Markets. Euronext Cash Last Price includes last traded prices together with additional value added information such as opening, high, low and closing prices for every security (Euronext Equities and Warrants) traded on the Euronext Cash markets. The European Equity Off Exchange Trade Reports product provides information about off-exchange trades in a broad range of listed European Equities and ETFs. It contains trade reports submitted by investment firms to Euronext via the Trade Publication Service.